"No good works are accomplished by our efforts alone but by the power and will of God. Nevertheless, God demands effort on our part in conforming to His will." 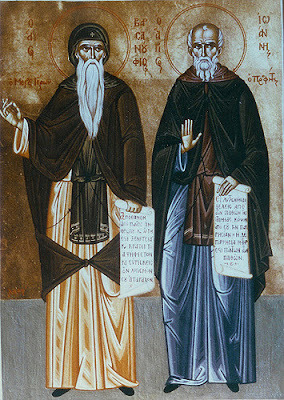 These are the words of Saints Barsanuphios and John. Few words but much said. We are obliged to labor, to cultivate and to prepare every good thing, and if some good will take root, grow and bring forth fruit, that is up to the power and will of God. We plow the furrows and God sows, if He wills it. We cleanse the vessels of the Spirit and God pours the Spirit into these vessels, if He wills it. He can do anything if He wills it. And He will do everything that responds to the highest wisdom and suitability, that is, to His plan of man's salvation. In interpreting the words of our Lord, "So be shrewd as serpents and simple as doves" (Matthew 10:16), Saint John Chrysostom writes that our Lord gave this commandment to His disciples that "they themselves should cooperate in some way, so that it will not to appear that all effort is of Grace alone and for them not to think that they received the wreaths of glory for nothing." And so, both of them are indispensable for our salvation: our effort and the power of God's Grace.